Customer Convenience: it is the driving force behind the more than 500 U.S. financial institutions that are adopting the latest mobile solution: “Person-to-Person” (P2P) payments, which is empowering customers to easily and quickly send money to family and friends via email or text message. 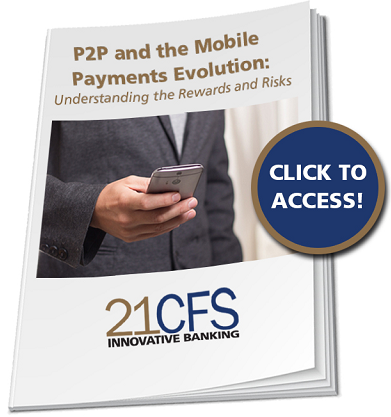 FIS offers faster P2P payment services via the Zelle Network to their Mobile Banking Users. As a partner of FIS, 21CFS is ready to provide this same innovative service to our financial institutions customers as well. with the 21 CFS guidebook.